Mobile nail station for nail artists. A portable workstation conceived for nail artists and nail specialists working at home and on the move. Very useful also as an extra table for makeup services on the set. It is a light and handy to bring around trolley that turns, with a fast and easy set-up, in a very comfortable nail-station. The ideal accessories to add in order to improve the functionality of the workstation are the nail box, a light and spacious thermal beauty which can be fastened to the nail trolley handle to store and bring the products, and the foldable, telescopic stools to comfortably sit everywhere. The surface of the mobile workstation is solvent-resistant. Black colour, finishings in aluminium and chromed hinges. the print of your logo (the logo will be marked in white on the lid or/and on the mirror): choose the option, complete the order and then send us an email with your logo. We recommend to send it to us only in vector format (.AI or .PDF, only one path). Logos in another format can not be printed. For additional information, you can send us an email or call us using the references on the site. 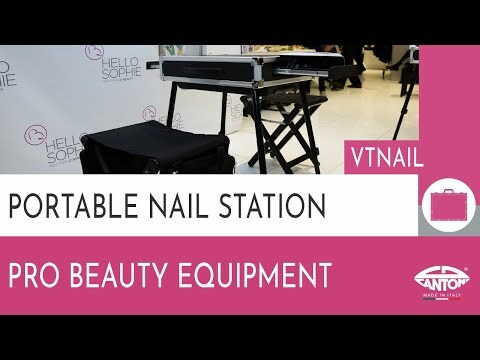 nail artists working in beauty salons: it is possible to set up the station only when required and store it when not, to save space. Professional image: no need to "arrange"
it is highly recommended to consider the purchase of the BB2.N thermal nail box to carry all your tools. CANTONI ONLINE SHOPPING: DISCOUNTS AND PRICES YOU DON’T EXPECT! CANTONI’S VIDEO TUTORIALS: SEE IT WITH YOUR OWN EYES! CANTONI IS LOOKING FOR BLOGGERS, VLOGGERS AND WEB WRITERS! #CANTONIMAKEUPWORLD CONTEST: TRAVEL THE WORLD WITH CANTONI! SHEER ILLUMINATING FLUID AND POWDER: THE REAL SUMMER MAKE-UP! CONCEALERS AND CAMOUFLAGE: CHOOSE THE RIGHT COLOR! UNICA LOOKALIKE CONTEST: BECOME A CANTONI STAR! What is the ideal light for make-up? Cantoni at Cosmoprof 2016: we celebrate our 20 years with discounts and Cosmoselfies! Looking for Christmas presents for makeup artists?